Researchers from Samford University’s McWhorter School of Pharmacy, Children’s of Alabama and University of Alabama at Birmingham are collaborating to solve a puzzle that could positively impact the care of critically ill children. The pilot study that began in February 2015 aims to determine the effect that continuous renal replacement therapy (CRRT) has on antibiotic levels in critically ill pediatric patients with acute or chronic renal failure. CRRT does the job of the kidney-- removing fluid, clearing waste products and balancing electrolytes--while the kidneys are not adequately supporting critical functions, he said. At Children’s, Askenazi and his team cared for more than 50 such patients for a total of 275 hospital days in 2014. Gorman and other researchers want to know more about the amount of antibiotic that is reduced during CRRT. While studies have been conducted in adult patients, there is little data on the correlation of CRRT and the removal of healing antibiotics in pediatric patients. The lack of such data on young CRRT patients does not surprise Gorman, a veteran drug researcher who is founder and research director of the Samford pharmacy school’s Pharmaceutical Sciences Research Institute. Parents of patients in this study, however, can relax about any additional strain on their sick child. “The patients are getting the antibiotic anyway and are already on CRRT, so there is really no extra burden put on the patient, unlike what people usually associate with clinical trials that may test a new drug or procedure,” said Gorman, whose Ph.D. is in chemistry. Blood samples are taken through an existing port or line in coordination with other clinical lab draws when possible,” Gorman said. Children’s pediatric intensive care unit (PICU) nurses who provide care for patients in the study collect the samples, which then go to the pharmacy school scientists for analysis and pharmacokinetic interpretation of the data. That part of the study is done in a laboratory in the pharmacy school’s Ingalls Hall at Samford. Later, the medical and pharmaceutical research teams review the data to determine the impact of CRRT on the drug level. Children’s research team member and PICU pharmacist Laura Daniel, Pharm.D., anticipates that the research will significantly add to the knowledge base on how to dose antibiotics in patients who are on CRRT. “Hopefully, if a patient has an infection, we can put that patient on the correct dose immediately once we get better CRRT dosing recommendations, thanks to studies like this one,” said Daniel, who is also the resident preceptor at Children’s. Even though the study is in its early stages, Daniel has a sense of what conclusions may lie ahead. ”I think we are under dosing because we don’t know how much antibiotic is being pulled off,” said Daniel, a Samford pharmacy graduate and clinical pharmacist whose job is to ensure that medications prescribed for Children’s patients are safe, effective and optimally dosed. “Very early data suggests that CRRT is removing a significant amount of the dosed antibiotic, thus making the dose less effective to treat the patient,” Gorman said. This suggests that CRRT patients may need a larger dose than would a non-CRRT patient in order for the antibiotic to stay in the body long enough to be most effective. Daniel looks forward to adding more patients to the study, which now has 10 participants. The optimum number to produce clinically significant statistics would be about 25, said Daniel, who appreciates the cooperative parents. “They are informed that there is no inherent risk to their child, and they understand that it will benefit future patients,” she said. In addition to Gorman and Daniel, the team of research investigators includes Children’s medical staff members Franco Diaz-Rubio, M.D., Yuvraj Kalra, M.D., and Kate Sewell, R.N. ; and Samford pharmacy faculty members Kim Benner, Pharm.D., and Pam Sims, Pharm.D., Ph.D. The consensus among researchers is that the collaborative study is a win-win all around. “Children’s is a teaching hospital with medical, pharmacy, respiratory therapy, nursing, physical therapy, clinical nutrition and other residents,” Daniel pointed out. 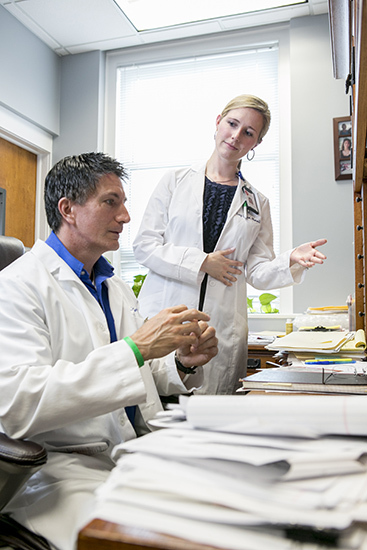 Tapping into a respected pharmacy school’s faculty expertise and available research technology, such as at Samford, she said, shows practitioners in all fields how a collaborative effort can benefit patients. “We can gain data to help serve patients better in the future,” she said.